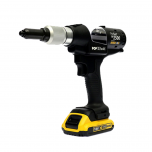 POP battery-powered rivet guns are designed for portability, durability, and easy maintenance. They provide many innovative high-performance features including a patented Quick Disconnect nose housing and jaw case for rapid cleaning and maintenance of the front end without the need for any tools. request a consultation or call the POP tools experts at (972) 986-6792 for help.